In A Tale of Two Cities, Madame Defarge spends her days knitting an encoded commentary on the Ancien Regime, marking allegedly guilty individuals for execution. 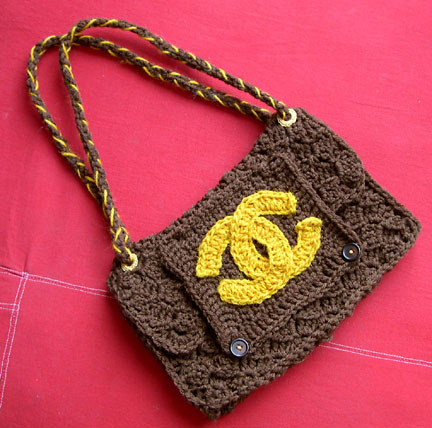 In Anti-Factory's Crochet Bag Project, San Franciso-based visual artist Stephanie Syjuco takes up yarn and needle to forge another (and somewhat less bloody) social commentary -- this time on counterfeit handbags. By choosing the "lowly" craft of crochet, she intends to highlight the distinction between commercial and vernacular expression and focus attention on "issues of piracy and bootlegging in today's globalized economy." The ultimate goal of Stephanie's fascinating project is an art installation -- including not only her own work, but yours as well. To the barricades!